They will fight against you but not prevail over you! Stepping into the unknown can be daunting yet exciting at the same time. Having worked for my former employer for the last thirteen years, it became clear that change was necessary, but not without first getting a clear perspective on what that move would be. Having prayed about it, I clearly knew what needed to happen as the signs were presented to me. As they would say: "the ducks were lined off in a row." Once again, the members of St. Thomas More welcomed their new priest this past weekend for what would be his first Mass as pastor of our small parish. Fr. 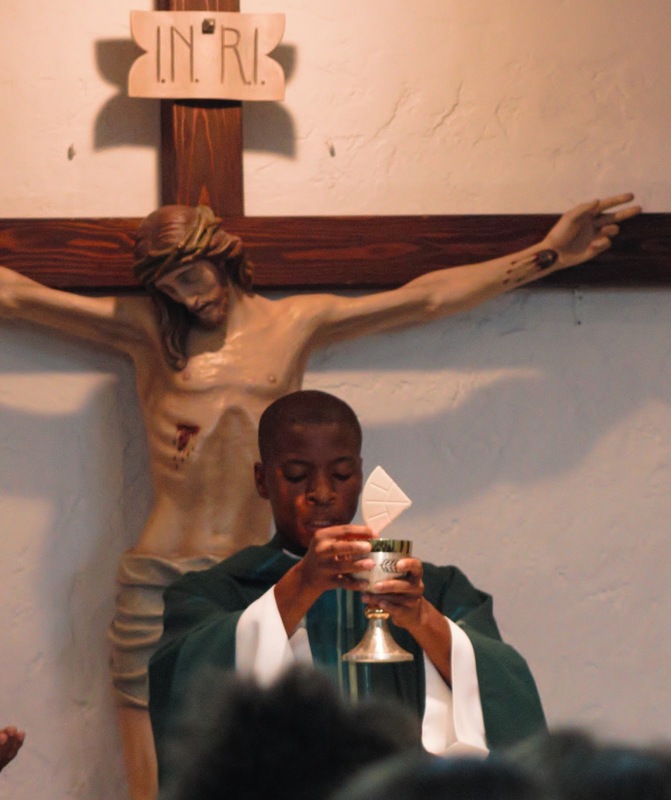 Noel Clarke, being one of the younger priests within the Archdiocese of Nassau was transferred from St. Bedes Parish located in the Wulff Rd. Replacing Fr. Clarke at St. Bedes is Fr. 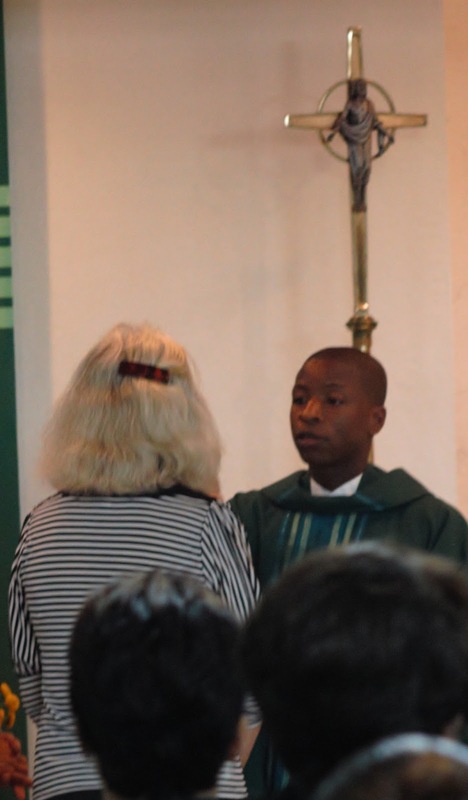 Jude mukowe, a South African priest from Nigeria who has been with the Archdiocese since March of 2012. Unlike myself who was blessed to once again be a part of a very familiar environment, Fr. Clarke will take on a new experience, as he becomes the shepherd of a new breed of flock. I have always hated starting over from scratch, when familiarity becomes a way of life for many of us. Fear to take the plunge into what we consider the unknown can deny us of many opportunities that can possibly change our lives for the better. Everything we do should always be presented to God first so that we can know for certain if it be His will for us. As Fr. Clarke began his new ministry on Saturday, 2nd February, 2013 the members welcomed him with open arms. On the flip side there will always be those who find the bad in every priest who takes over their parish, so I'm expecting no less this time around. Once again I reiterate that there are no two priests who are the same. 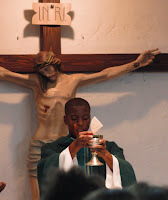 One priest will be strong in the area of homiletics while another may have strengths in communicating personally with the members. In each case members should learn to feed off the strength of their priest and offer assistance where they may fall short. I am reminded of my school days during which time there was always a period where a substitute or a replacement teacher was called in to assist or takeover the class completely. For many of the students this raised concerns that the new teacher would not teach as good as the former, while others had something completely different on their minds; how are we going to show this new teacher who is boss? During a time when change is difficult for many to accept, the second reading from this weekend came from 1 Corinthians 12:31—13:13, which was quite appropriate as we search deep within ourselves to examine our conscience on the meaning of true love. In everything we think, do and say, without love we are nothing. It has always concerned me that there are some in our Churches (not pointed fingers to any one particular Church) who will do and say whatever they must in order to have their own way, even if it results in an unfriendly relationship with the person who represents persona Christi. hopes all things, endures all things." Without a doubt love is a gift, a gift from God that must be nurtured. As Fr. Clarke embraces this new opportunity as Parish priest of St. Thomas More let us take a moment to search deep within our heart as we compare our love to that which St. Paul defines above. There is plenty of work to be done and each member is being called to duty. Let us embrace this new change and work feverishly to do all we can in the love of God to help our Parish priests in their assignments. It will take all of our efforts to get the job done.